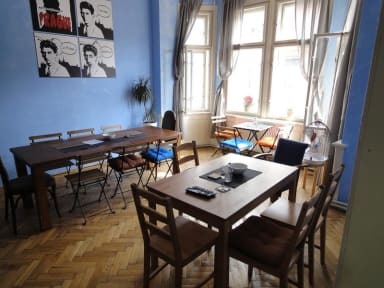 Franz Kafka Hostel i Prag, Tjeckien : Boka nu! I really enjoyed my stay here. It is in the very center of the city and the hostel boasts nice and clean rooms with nice facilities.You definetly get your money's worth. However, the staff is a mixed bag. The cleaning lady was nice and so was one of the male staff (he was super nice). But, some of the female receptionists barely even smile and it does give off a bad first impression. It is also worth noting that there is no common room in the hostel to meet other people. Very friendly and helpful staff! A bit worn down facilities but definently would recommend staying here to anyone, the location is super.